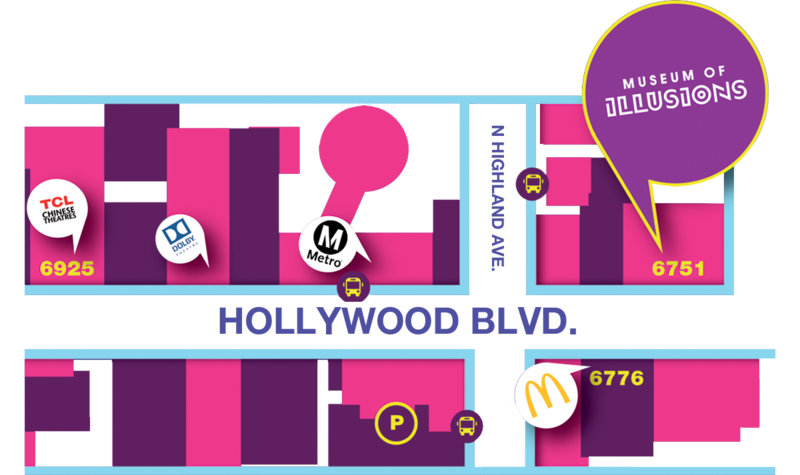 Conveniently located next to the Hollywood/Highland Metro station right in the middle of Hollywood. To reserve your parking spot, visit the Museum of Illusions SpotHero Parking Page and book a spot with rates up to 50% off drive-up. Tickets are also available for purchase in person everyday at the door from 10AM to 11.30PM. General admission tickets for everyone who wants to enjoy the museum. Skip the line (if any), get your own personal photographer and a special gift. Get all your kids with you to this magic journey at discounted price. FREE admission for children 5 years old and under. Strollers are allowed inside. Excellent package for those hanging out in groups. If you buy 5 tickets you will get another one for free. Great for holidays, birthday presents, or just to show you care, with our e-gift cards you can give your friends a one of kind experience and they will never forget! Share the wonder, joy, and amusement that the Museum of Illusions is famous for with our e-gift cards. The perfect gift for any and all to experience magnificent 3D illusions. At the Museum of Illusions we offer special pricing for all sizes of groups. Treat your party to a unique experience and amazing illusion adventure. Groups have full access to all of our interactive exhibits and art pieces. Take photos of everyone having fun while sharing the joy and wonder of breathtaking illusions. Ride aboard the Titanic or survive a meteor shower, with a wide variety of group packages, contact us today to plan your next visit! The Museum of Illusions is proud to offer packages to school groups, perfect for a field trip and educational visit! Here the children can learn about the science of perception, the art of perspective, and of course have FUN! This is an interactive and educational experience for all ages they won’t forget. Contact us here today to schedule your next amazing trip! Our VIPs are guided through the museum by your own personal photographer that will take your photos! You’ll feel like a movie star when these paparazzi pictures are developed. And as you know Hollywood stars get gifts at award shows, which is why the Museum of Illusions gives all of our VIPs a special gift at the end of the experience. Perfect for a fun date and capturing the best insta-worthy pictures! Take the Metro Red Line to Hollywood/Highland Station. Museum of Illusions is only a 3 minute walk away from the station. Plan your trip using the Trip Planner or call 323.GO.METRO (323.466.3876).